Diverse range ... bonded anchors. UAE-based Rawlplug Middle East, a leading fixings specialist, plans to boost its comprehensive line of solutions with a new range of products, including green fixings for sustainable projects and passive fire protection systems, in line with its surging business in the region. “Sustainability is at the heart of Rawlplug’s business. We fully understand that to be a successful, effective and responsible business today and into the future, sustainability needs to permeate our whole approach to what we do and how we do it,” says a spokesperson for the company. • Contributing to the communities of which it is a part. Rawlplug supports those in need at a practical level. It also promotes, encouragse and delivers education and training to students, clients and stakeholders alike. Sustainability is built into the entire lifecycle of Rawlplug products and operations. Mechanical anchors insulation fixings ... from Rawlplug. “Our business mission is to supply clients with the highest-quality products possible, and to continuously drive innovation into our products and processes. Today, the Rawlplug brand is built on a heritage of providing high-quality goods to the premium and mid-range segments of the industry. This has enabled us to establish a position of leadership in the European market. “In what is a highly competitive global industry, we understand that both maintaining our existing position in the European market and successfully expanding into fast-growing markets will be instrumental in securing our long-term future,” says the spokesman. “We firmly believe that our sustainability goals go hand in hand with our mission and vision for the Rawlplug business. By improving the environmental efficiency of our operations, using natural resources with greater consideration, driving sustainable processes into our production and business processes, looking after our people, and contributing positively to the communities we inhabit, we believe that we will be optimally positioned to succeed internationally for decades to come,” he remarks. The UK-based Rawlplug, which has been operating in the Gulf for more than 30 years through a network of distributors, set up its regional hub at Jebel Ali in 2006 to better serve its customers and reduce delivery time. The company has plans to expand its warehousing facility next year to cope with an increased demand for its products in the regional markets and to streamline logistic operations. Rawlplug has witnessed 65 per cent growth during the first half of this year compared with same period last year. “Business has been very good and we are looking at new markets in Asia for further growth,” says the spokesman. The product range of the company – which comprises almost 30,000 line items corresponding to products and its variants – includes bonded anchors, which are offered in a wide range of systems like glass capsules, cartridges and foils, and mechanical anchors, which are metal anchors. Commonly referred to as chemical anchors or resin anchors, bonded anchors can be split into two main groups – capsule and injections systems – both of which consist of two chambers, one filled with a polymer resin and the other with a hardener. 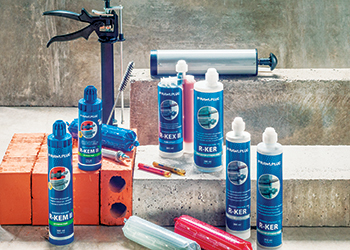 Various resin types are available in each system from polyester to vinylester and epoxy. 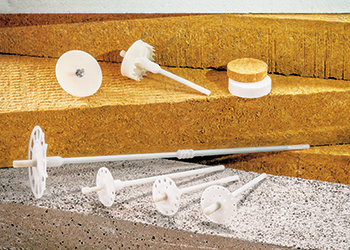 Mechanical facade insulation fixings ... from Rawlplug. 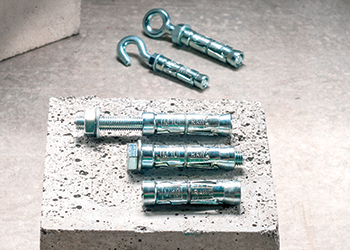 Mechanical anchors, used for high-load and technical applications, are offered as throughbolts, shield anchors and heavy-duty expansion anchors. 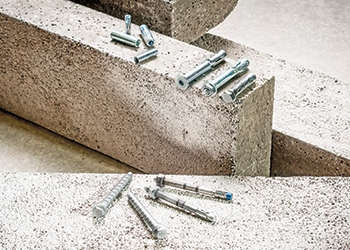 Rawlplug also offers a wide range of façade insulation fixings including external thermal insulation composites (Etics) and insulation fixings, and frame fixings available as fixings, screws and anchors. Rawlplug has recently been awarded key projects in the UAE including Al Fattan Plaza, Nakheel Mall, City Walk Phase Two, Hard Rock, Akoya Oxygen, Marina 106, Rotana Hotel, and Blue Waters Island. Some of its other major projects in the region include Sidra Medical and Research Centre, Kempinski Marsa Malaz Hotel in The Pearl Qatar and Brooq Residential Tower in Dafna – all in Qatar; and Makkah Holy Haram expansion, Mataaf, Shamiya Extension Hospital, North Haram development power transmission cable in Makkah, Haramain High-Speed Rail Phase One and King Abdulaziz International Airport Development Phase One in Jeddah, all in Saudi Arabia.